Copenhagen, Denmark - They came. They talked ... long into the night. 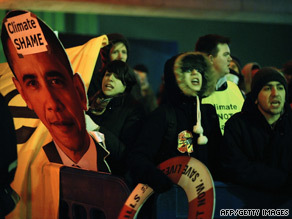 Activists deliver their verdict on the climate change summit in Copenhagen. But in the end global leaders left the Danish capital practically empty handed. After years of negotiation and two weeks of concentrated effort, the world agreed on a deal on climate change. Whether it is a “meaningful” one, as U.S. President Barack Obama suggests, is up for debate. The president’s flying visit did help salvage some success from the disorder ... but in the end a slow hand clap as he made his way to the stage mid-morning showed the depth of divisions that still exist between the haves and the have-nots. Let's be clear: an agreement was brokered in what one commentator described as a "frenzied game of climate poker among the leaders of the United states, China, India, Brazil and South Africa and major European countries." They’d been chosen by the conference chair Denmark as the summit looked set to end in chaos. U.N. chief Ban Ki-moon admitted the agreement had failed to win global consensus and would disappoint many who demanded stronger action against climate change. But, he said, at least it had not been strangled at birth. "Many will say that it lacks ambition," Ban said. "Nonetheless, you have achieved much." China’s resistance to monitoring carbon emissions was a key sticking-point for the West. It’s still not clear whether that issue is fully resolved. Late on Friday night, Greenpeace international executive director Kumi Naidoo spoke for many when he said the deal’s loopholes were big enough to fly Air Force One through. "The city of Copenhagen is a climate crime scene tonight, with the guilty men and women fleeing to the airport." So, while global leaders stood shoulder to shoulder smiling for the inevitable class photo, they effectively left shaking hands on nothing more than a commitment to agree to agree to something more substantive in the future. It was by anyone’s standards a valiant effort by the Danish hosts. But it was the disorganisation and disarray both inside and outside these halls that eventually won out. What had been billed "Hopenhagen" as delegates and activists arrived here just two weeks ago will perhaps be best remembered as "Brokenhagen" by many.